No, emergency dispatchers don’t count. Those calls are welcomed by southeast Florida snook nuts, who are wide awake and fishing in the middle of the night, when the big ones feed most actively. It’s a friend on the other end, saying or asking where the fish are active and where they are not. 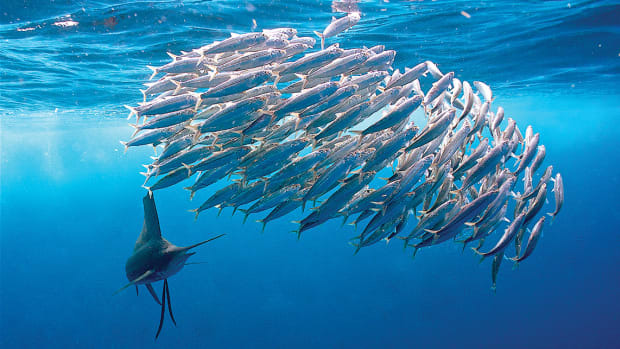 They report on schools of forage fish within range of a throw net. Information is exchanged freely. There are few, if any, secrets. “Snook fishing is a coalition of 100 guys, and we communicate. We call each other and ask questions,” says Florida snook guru Tom Greene. Greene is a supersnooker, not the only one in his southeast Florida territory but he could be the one to whom others owe the most, directly or indirectly. Down there, if someone other than Greene taught you much about snook fishing, he likely owes at least some of his knowledge to Greene, or to someone else who learned from him. 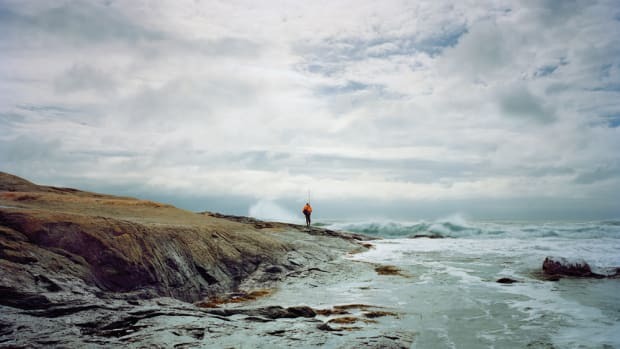 Greene is 66, a fishing-doer since age 11 who began his career as a boy-of-all-work in a bait-and-tackle shop, used a redwing blackbird for bait, swam across an inlet from jetty to jetty rather than lose a big jack, and on his way up did other stuff that most of us would regard enviously as stark raving goofy. 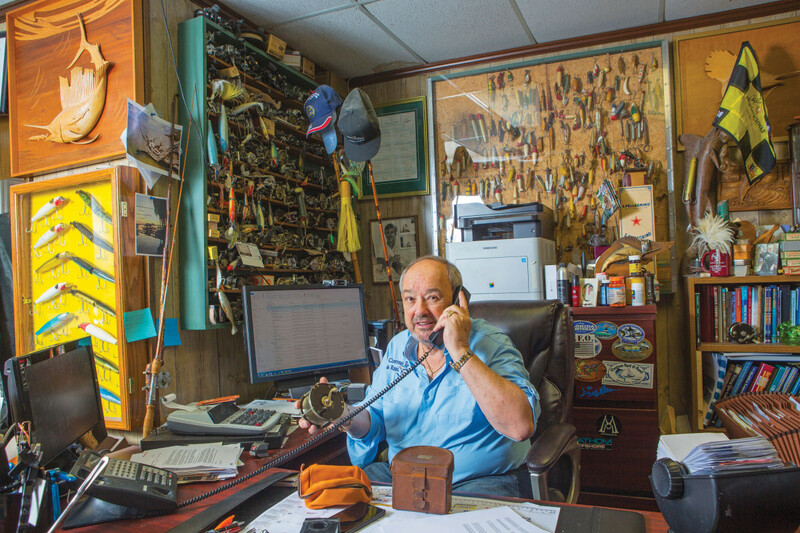 Up is where he is now — a 6,000-square-foot tackle shop called Custom Rod and Reel in the Fort Lauderdale suburb of Lighthouse Point, close to Boca Raton, where Greene started fishing to help feed his underfunded family of 10. They ate a lot of snook. When the limit was four a day — it’s one a day now — he would keep four before midnight and four after. Boca had a convenient ocean inlet and Boca Tackle, a store with its own fishmongery. If there were child labor laws, enforcement must have been soft. The owner, Bill Kane, gave the kid a job. 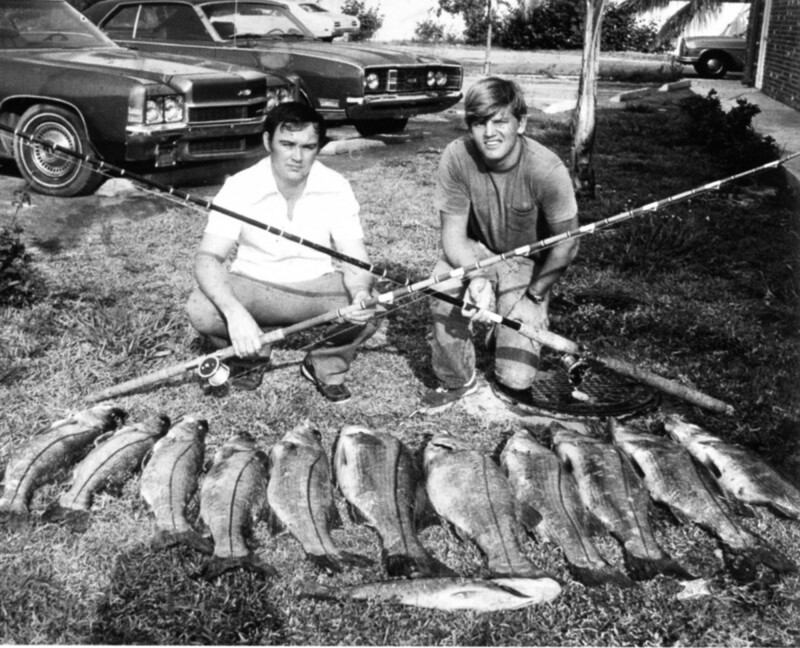 Greene did everything from mopping the floor to fishing the snapper and grouper reefs for the store’s market. 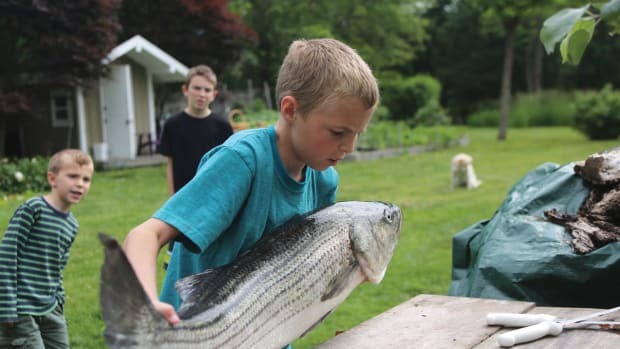 The Greene family learned quickly about fishing as an inexpensive food source. Greene’s dad scrounged up $4.95 to buy an extra-cheap spinning outfit and enough spare change to outfit the whole band with cane poles. The kids would rotate the rod and reel every 15 minutes or so. Greene was industrious. He built a reputation; people hired him to guide. At age 15, he filed a tax return as the head of a family with five dependents. His dad, a diabetic, had gone blind, and Greene was the bread- … no, the fishwinner. Whatever we fish for, we all begin by learning from others. At some stage, we begin to figure things out for ourselves, and then, uh-oh, we start thinking we know a lot. Even if we’re right, sometimes we miss something. At times like that, a snook fisherman can call Tom Greene, who doesn’t have to look up the answer and may tell him more than he wanted to know. Greene is not taciturn. Get him started and he’ll talk your ear off. He can’t help it. He knows that about himself and doesn’t apologize. “I love teaching people how to do it,” he says. When you ask a man to talk about himself and his achievements, you license him to boast. Ego and confidence run together. “If you done it, it ain’t bragging,” the poet Walt Whitman is said to have stated. Baseball eccentric Dizzy Dean also put it that way — two great minds with the same thought. Centropomus undecimalis, the common snook, is the predominant snook species of Florida and the Caribbean. There are a few others. Never mind those. Snook are protandric hermaphrodites. Without surgery or concern for social consequences, they are born male and change gender after maturity, some time between 1 to 7 years. The bigger a snook, the more likely it’s female. The International Game Fish Association’s all-tackle record for snook is 53 pounds, 10 ounces, a 48.5-incher caught with a bucktail jig on 15-pound test thrown with casting tackle. It was caught in 1978 at Parismina Ranch on the Caribbean coast of Costa Rica. 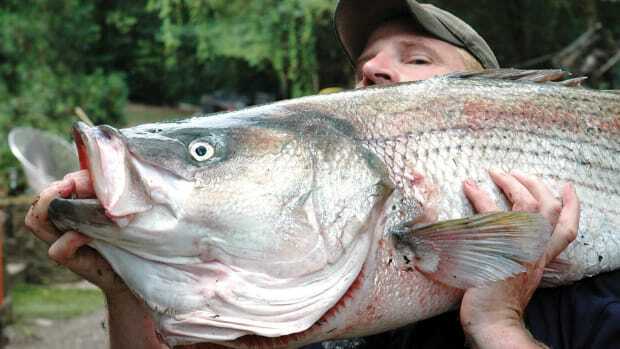 The Florida record is 44 pounds, 3 ounces, caught in 1984 on the Gulf Coast near Fort Myers. In 2000, a Florida high school boy, Zack Kahelin, caught one on live bait in Stuart that could have gone between 52 and 55 pounds, according to a formula based on uncertain length and girth measurements made with string. The kid didn’t have a scale. The snook’s range is on both coasts of the lower half of the Florida peninsula. It’s liable to be found wherever there are mangroves — Everglades National Park’s coastal waters have great backcountry snook fishing — as well as in cities. 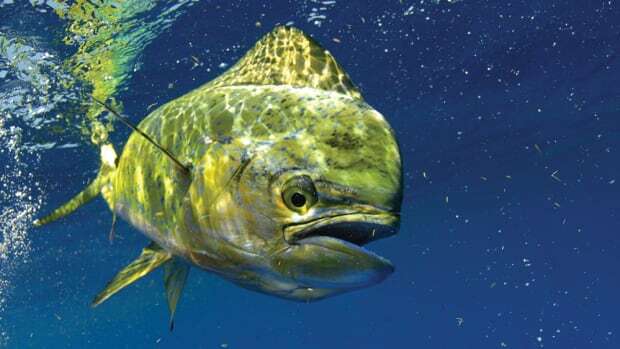 Florida’s Fish & Wildlife Conservation Commission has posted a vast amount of information online about snook, but little of that tells you what compels a snookhead’s devotion. 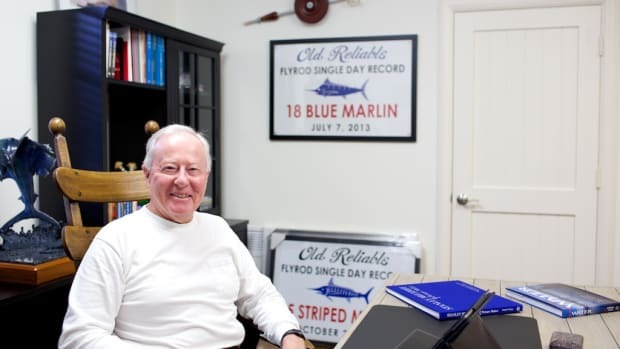 “The thump,” says Mike Theis, Greene’s custom rod builder for the past 25 years. Thump, hell. They talk like men who’ve caught too many snook. Take it from one who hasn’t caught enough: “Thump” scarcely says it. No, the strike is more savage, more violent than thump. 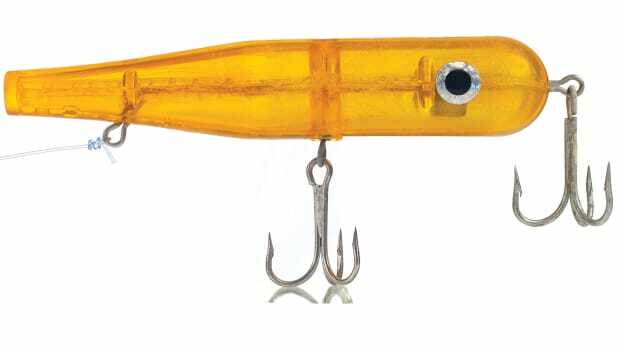 Even when you’re rigged, baited and fishing for snook alone, it’s as sudden and startling as a cherry bomb in a library. You can’t put enough exclamation points on “thump” to express that. How about bang? No, BANG! That can’t get old, can it? Ask Greene. The fish is more gulper than biter, yet its coarse sandpapery lips can sever a light leader instantly. Forty-pound test gives them a sporting chance to bite you off, and 30 is kind of insulting. Fifty-pound test may be stout enough for big ones. Bigger ones can rub through 125-pound test in a minute or two, Greene says. The snook is an ambush feeder — a mugger that waits for anything it thinks it can whup to cross the shadow line made by the bridge above and the topside lights. In mangroves, it lurks patiently among the roots, or stakes out on the slack side of a current seam to seize anything that swims by. Soft takes happen seldom. Southern Florida is crosshatched with canals, dug long ago to drain the land for farming, suburbs and cities. In summer’s rainy season, when the dam spillways open, forage fish pour out in the downstream turbulence. Snook don’t have to be clever there, but the violence of their strike doesn’t abate much. They are strong-arm thugs, sneaky as they need to be without the refined stealth of a pickpocket or shoplifter. Snook don’t feed as actively in daytime as they do at night. It’s too bad a man can’t fish all night and work all the next day. Greene once could. “I’m too damned old,” he says. “I don’t recover as fast. I used to fish seven nights a week, 100 out of 120 days in snook season. You can’t fish all night and then work 12 hours a day, every day, but I used to try to do it.” Theis, the rod builder, still does it, but he’s 43. 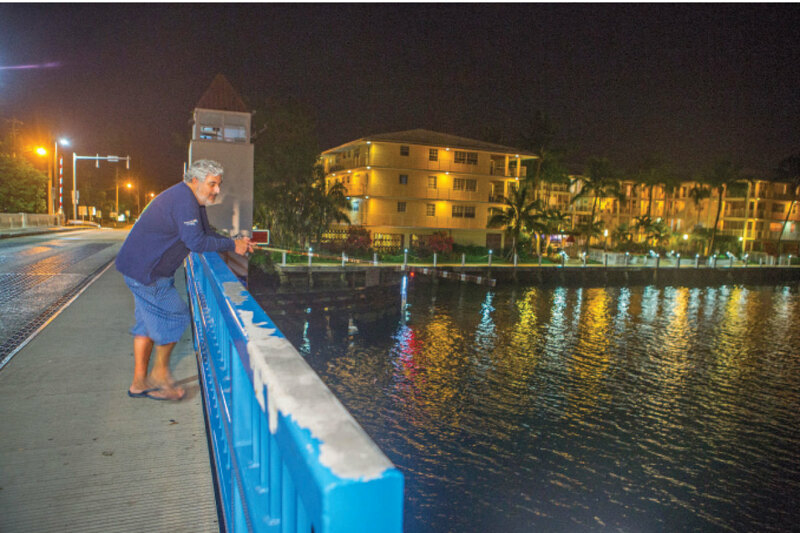 He learned from Greene and his own experience that he can bracket the night sessions to an hour or so on either side of the high tide or the low, and still do pretty well. I fished two nights with him, starting after midnight, and we didn’t do well. The next day, he went to work. I slumbered until 11 a.m.
On the day a new spillway opened in Boca Raton, Greene planned to fish the bait surge for a while and quit in time to play usher at his sister’s wedding. 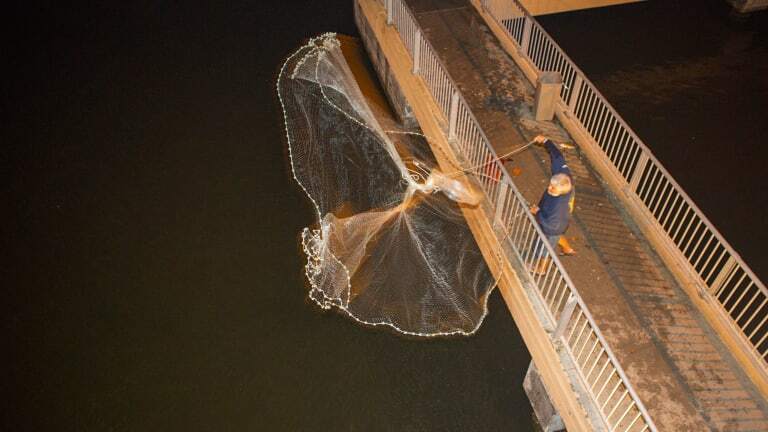 “One more cast,” he kept saying. “One more snook,” he kept catching. He missed the wedding. Theis’ wife, daughter and son fish with him, not all night on bridges but across the state on a shallow-draft boat in the Ten Thousand Islands and Everglades National Park. Like a pro golfer who recalls every stroke, Greene seems to recall every fish, or at least every trip that was better than pretty good. He can tell you snook numbers and sizes from last night’s catch all the way back to 1959. His first, for example. Before that, Greene fished for bass. One of his favorite spots was a pond called the Muck Pit. It also was a favorite spot of redwing blackbirds. Tom saw one swoop so close to the surface that a jumping bass caught it. That gave him an idea. “At certain times of the year they have 10 million blackbirds there — every day, swarms of blackbirds. I told my older brother, and he said they’re good eating, like doves. Of course, it’s unlikely there were 10 million blackbirds. 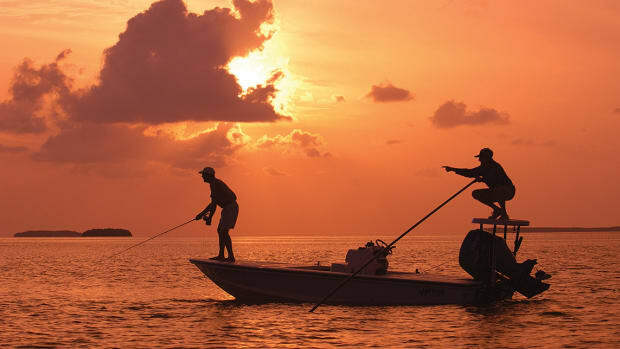 The sport of fishing deplores exaggeration, so call it an innocent overestimate. Greene dips the rod, tosses the jig upward, making two yo-yo circles, and pitches the jig like a bass fisherman. 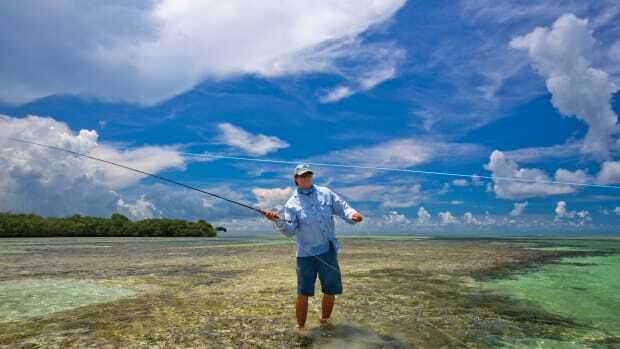 He thumbs the reel, and the jig catches my finger, wrapping the braided line around it. “Now stick out your pinky,” he calls, and does it again.